"Go ahead, Simon, and after you're dead, let me know where you are over there. In heaven or hell." Along with Pudovkin and Vertov, Alexander Dovzhenko and Sergei Eisenstein stand as solid representations of early Soviet revolutionary filmmaking. 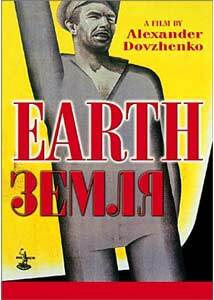 Image Entertainment has captured two examples of works by Dovzhenko and Eisenstein onto one disc, and give historically-minded film fans a chance to get a glimpse of two works that were considered politically volatile when made in the 1930s.Earth (01h:09m:45s)Director: Alexander DovzhenkoMade in 1930, this is Dovzhenko's third film in a trilogy, following Zvenigora and Arsenal, concerning Stalin's program of industrial collectivization. Filmed in his native Ukraine, Earth is centered around a rural farming village, and how the introduction of a motorized tractor, dubbed a "communist steel horse," serves as a catalyst to connect the poor villagers together and enhance their way of life with increased prosperity.Though the print itself is flawed, Dovzhenko's imagery is still strong. His moving sequence heralding the arrival of the tractor, and it's subsequent dramatic impact on the villagers, is as well crafted as anything seen today.Bezhin Meadow (31m:19s)Director: Sergei EisensteinEisenstein's film was banned by Stalinist officials in 1937, and all prints were eventually destroyed in a fire as a result of German bombing during World War II. This thirty-minute film represents a restoration made by Soviet researchers, using sketches, clippings, single frame negatives and Eisenstein's own production records, to piece together his lost epic.The finished product, here referred to as "Sequences From An Unfinished Film," are primarily stills, set to music by Prokofiev. If Bezhin Meadow had survived, it would probably still stand as a surreal and poetic classic of Soviet cinema, if the images shown as part of the restoration are any indication. Beautifully framed black & white images, with a powerful use of shadow and lighting, reveal what can only be described as haunting. Like Dovzhenko, Eisenstein's lost film also dealt with Soviet collectivization, and focused on a young peasant boy who is killed by his counterrevolutionary father. Image Transfer Review: Earth has not aged well since 1930, and it appears that the only available source print is in poor condition. This 1.33:1 full-frame black & white transfer is full of nicks, splices, flicker and assorted other image distractions. This print was mastered from a 35mm master print, and it is apparent that this is as good as Dovzhenko's film will likely ever look. As a historical document, the image quality is satisfactory, but as a film it is severely under par.Eisenstein's Bezhin Meadow, while not exactly a "film" in it's present condition, looks much better than Earth. Consisting primarily of still images, the prints are free of any glaring defects and look very crisp and detailed. Audio Transfer Review: Both features are presented in mono, with Earth having the original, slightly scratchy, orchestral score by V. Ovchinnikov added as the only source of audio. Dovzhenko's film is silent, and uses Russian intertitle cards with superimposed English subtitles by Steven Hill. The only dialogue occurs during Eisenstein's Bezhin Meadow, and that is only a few brief comments from a narrator explaining the restoration of the film. The remainder of Bezhin Meadow is also dialogue-free, and uses music from the works of Prokofiev. Extras Review: No extras here. From a strictly historical perspective on Soviet revolutionary cinema, this Image release is obviously important. As relevant modern-day entertainment, it is sadly dated and in poor condition. Film historians and history buffs may find much to rejoice about with this disc, and that is the ideal target audience for Dovzhenko's politically dangerous ideas. I only wish Eisenstein's Bezhin Meadow had fared better, and not been lost for good. From what is available here, it looked powerful and moving.